After a successful first edition in 2018, we are organizing a new Hammond event on April 13. On this day, the Hammond organ and all its capacities will be the central focus within Codarts pop and jazz. Keyboard players, organists, pianists, producers, enthusiasts and interested parties are all very welcome to participate in a dynamic program with mini concerts by talented international (former) students and a special workshop by Wiboud Burkens. Keyboardist and producer Wiboud Burkens is active within a broad spectrum of music. From Anouk to Kane, Lalah Hathaway to Candy Dulfer, and Lilian Viera to Jungle by Night: he can be heard on over 100 CDs. His love for vintage instruments, the Hammond and a mix of those with modern technology, are central to the active workshop. The Hammond organ as main and secondary subject in both the bachelor and master is a unique study* at Codarts. This afternoon, program leader and teacher Carlo de Wijs will present and give a mini concert together with his futuristic Modular Hammond and Hybrid Drummer Jordi Geuens. *The Hammond organ education will show students the endless possibilities of this instrument and sound, drawing on various musical genres, trends and traditions. In addition to the regular components of the Codarts curriculum, such as bands and ensembles, music theory, artistic research, masterclasses and entrepreneurship, there are specialized components of the Hammond curriculum focusing on: sound, dynamics, coordination, bass skills with both hands and feet, existing and new Hammond (Songbook) repertoire, experience within live- and studio settings, music production and the adaptation of Hammond techniques on other keyboard instruments. Information, Q&A, interviews & more! As a Hammond organ student you are part of the department of pop-keys or the department of jazz piano. This means that you will follow the program of the main subjects mentioned next to the specific Hammond lessons. The Hammond student will also become proficient on the piano and other keyboard instruments and in music production techniques. Choice of the pop or jazz discipline depends on the student's preference and aptitude. · Establishment and affinity with the instrument in the field of coordination, sound, timing and musical environments in which the instrument is used, both as a solo instrument and in a band. · A broad musical concept with regard to the instrument and the environment, from jazz to blues and gospel; from funk to pop. · Interest in the history of the instrument and an open attitude towards innovations in the field in technology, sound and use. · The improvisation on one of the above pieces or a pre-sent chord scheme. · The ability to play harmonic bass lines yourself on the parts to be performed in the left hand or with the feet on the pedal. · Sight reading of simple sheet music (notes and chords). · Playing back chords and melodic fragments by ear. · Playing single major and minor scales over two octaves, authentic, melodic and harmonic. · Simple chord connections, knowledge of the 'basic' jazz voicings and their application on the basis of chord symbols. Carlo has played in his own ensembles, including D’WYS & Voices of Soul, and as soloist with Candy Dulfer’s Funky Stuff, Benjamin Herman, Lucas van Merwijk and the Metropole Orchestra, and others. He has shared the stage with Steve Lukather of TOTO, Gary Brooker (Procol Harum), and Rhoda Scott. He has released eight albums of his own and was a session musician in countless productions. He also presented a special Hammond Alive programme on Radio 6 and initiated the website HammondSongbook.com. He is currently writing his PhD thesis on the history and innovation of the Hammond organ and working on the New Hammond Sound Project together with Codarts alumnus drummer Jordi Geuens. Recent Hammond students are Willem ‘t Hart (graduated in 2017) , Boye Ingwersen (current student), Quint Vullings (current student), Simon Oslender (graduated in 2018) and Robert Schippers (exchange student from Mannheim). Codarts en Hammond Suzuki Europa tekenden een letter of intent. Rechts op de foto Carlo de Wijs, naast hem Shuji Suzuki (president Suzuki Corporation), in het midden Jan Kok (directeur Hammond Suzuki Europe). Verder op de foto Shun Aoji (Hammond Suzuki) en Rob Broek (Codarts). Foto Marcel van Oostrom. On March 10th the introduction of Hammond at Codarts took place in a special event. Interested future students, keyboardists, pianists, professionals, teachers and enthusiasts visited this day. From September 2018 Codarts will start a renewed Hammond organ main subject (bachelor + master). 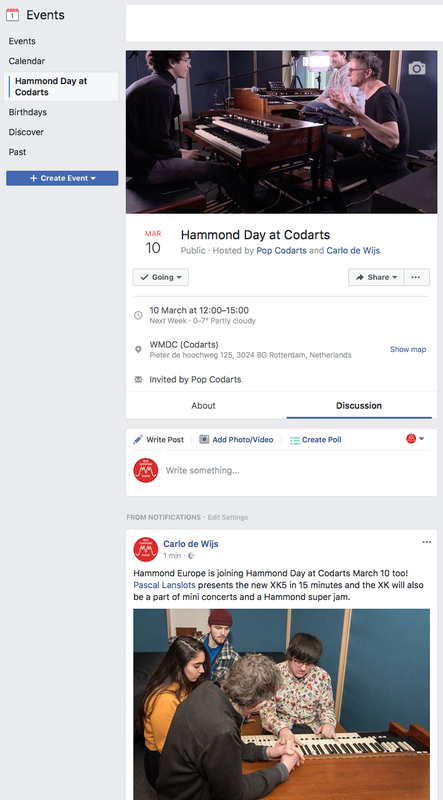 Carlo de Wijs, Hammond organ player with an international career is the initiator of Hammond at Codarts. In 2016 he received a scholarship from the Dutch Minister of Education, Culture & Science Jet Bussemaker for a PHD research project in the history and future of this musical instrument. The unique Hammond organ education will show students the endless possibilities of this instrument that has influences in several musical genres and traditions. Besides the regular components of the Codarts curriculum such as bands and ensembles, music theory, artistic research, masterclasses and entrepreneurship there are specialized components of the Hammond curriculum focused on: sound registration, dynamics, the coordination and bass skills with both hands and feet, specific Hammond songbook repertoire, the experience within live- and studio settings, music production and developing new repertoire. Besides the specific Hammond organ department Hammond is part of the already existing pop keys department, and there are possibilities to specialize within the main subject jazz piano. Main subject teachers of both departments are involved within the Hammond organ curriculum.